Another of our favorites from Michelle Tam of Nom Nom Paleo! Slice the asparagus crosswise in ½-inch sections. Heat a large skillet over medium heat. When the pan is hot, swirl in the cooking fat so you have a thin layer of fat coating the bottom. As soon as the fat is shimmering, toss in the shallots and a sprinkle of salt. Cook, stirring, for a couple minutes or until the shallots are softened. Toss in the minced garlic and cook until fragrant, about 30 seconds. Add the ground pork and break it up with spatula. Sprinkle on some salt and increase the heat to medium-high. Cook, stirring occasionally, for 3 to 5 minutes or until no longer pink. Toss in the asparagus coins and minced chilies, and cook until the asparagus are tender-crisp, about 2 minutes. Stir in the coconut aminos, rice vinegar, fish sauce, and sesame oil. Turn off the heat and adjust the seasonings. Toss in the scallions and you’re done! WOW WOW WOW! 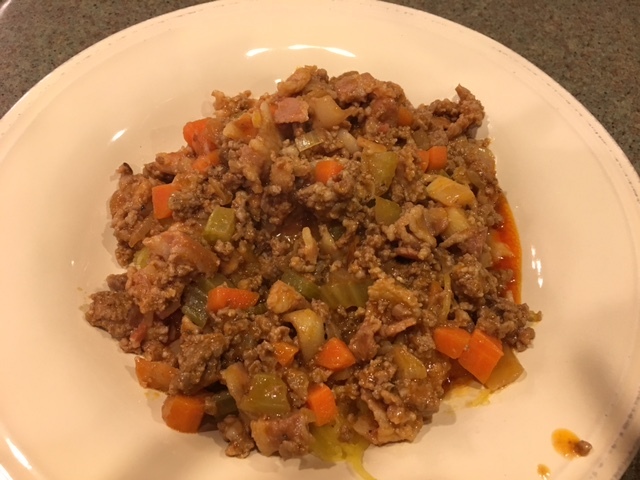 This recipe from Paleo Leap is soooo good! And as an added bonus it is quick! The whole family loved it. In a bowl, combine the paprika, chili powder, cinnamon, and salt and pepper to taste. Rub the entire surface of the pork tenderloin with the spice mixture. 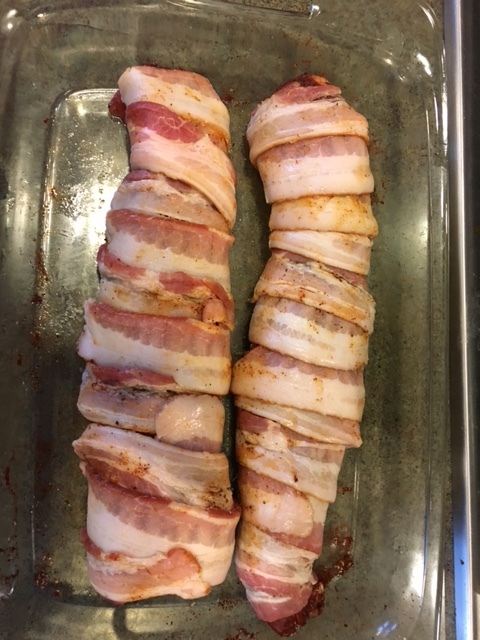 Wrap the tenderloin with the bacon strips, securing with cooking twine if necessary. In a bowl, whisk together the maple syrup, applesauce, and Dijon mustard. Melt some cooking fat in a oven-proof skillet over medium-high heat. Brown the tenderloin on all sides, 3 to 4 minutes per side. Brush the tenderloin generously with the maple syrup mixture, and place in the oven. Bake in the oven for 15 to 20 minutes or until it reaches your desired doneness, basting with the remaining sauce once in a while. Let the meat rest 5 minutes before slicing. Add beef, 1 cup enchilada sauce, bouillon, and water to the cooking pot. Press [Manual] and 30 minutes pressure cooking time. When beep sounds, turn off pressure cooker and use a natural pressure release for 10 minutes and then do a Quick Release to release pressure. When valve drops, carefully remove lid. Put a tortilla on a rimmed baking tray lined with aluminum foil, add approximately 1/2 cup beef to the center of the tortilla, fold in edges, and roll up into a burrito. Repeat with remaining tortillas. Top with enchilada sauce and shredded cheese. Broil until cheese is bubbly, about 2-4 minutes. The hubby found this one on buzzfeed and it is delicious! Poor it over some baked sweet potato cubes and it is one amazing meal. First, salt and pepper your short ribs. In a large, heavy-bottomed pot, brown the short ribs in oil. Remove and set aside. In the same pot, add the chopped onions, carrots, and celery. Cook until onions are translucent. Add the red wine, cook until some of the alcohol has burned off. Add the garlic, rosemary, tomato paste, beef broth, canned tomatoes and bay leaf. Return the browned short ribs, bring to a boil. Cover and lower heat to a simmer. Simmer for three hours or until the meat is very tender. Transfer the meat to a separate bowl, remove the bones, and pull apart the meat; return to the pot. Give it a stir so all the meat is coated in the sauce. Keep warm until ready to serve. Serve over sweet potatoes any way you like them! Thank you Sarah Fragoso of Everyday Paleo for this great go to recipe that the whole family will love! And you get to sneak some veges in to boot! In a large mixing bowl, mix together the meat, all the seasonings, and the diced veggies. Grease a muffin tin with coconut oil or ghee. Measure out 1/3 cup meat mixture into each muffin space. 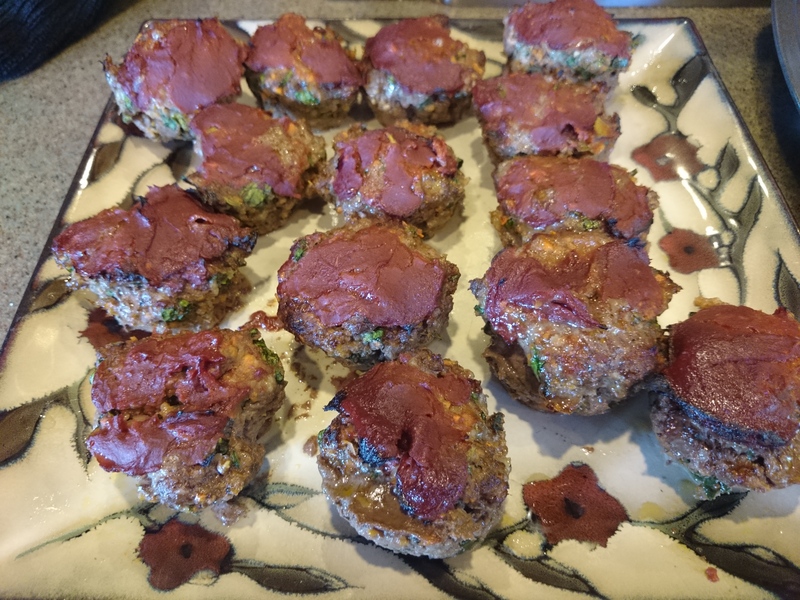 Spread a generous amount of homemade ketchup (or I’ve used tomato paste which I really like) on the top of each mini meatloaf and bake for 15-20 minutes or until the meatloaves are no longer pink in the middle. Taken from Stacy’s Primal Pantry archives! I make this one fairly regularly. The chicken is super moist and flavorful! The key is to “baste” it once or twice and to always take it out of the oven right before it reaches the proper internal temperature. The remainder of cooking is done while it rests. The result is a perfectly cooked and extremely most chicken that all will enjoy instead of endure. Remove chicken from package and remove anything from the cavity (neck and giblets should be within a fingers length). Rinse and pat dry with paper towels. Place chicken, breast side up, in a roasting pan or large casserole dish. In a small bowl, combine the grapeseed oil, salt, pepper, herbs and garlic until it is like a runny paste. Loosen the skin of the chicken over the breast and legs, if you are able. Rub the herb-garlic paste under the skin, spreading evenly. Rub excess paste over the top of the bird. Place chicken in oven and roast at 350 degrees for 20 minutes. Open oven and pour the chicken stock over the chicken. Return to oven and roast for 20 more minutes. Open oven and with a spoon or turkey baster, scoop liquid from the pan and pour over the top of the chicken a couple of times. Return chicken to oven and continue to roast for another 20 minutes. At this time, take an internal temperature read at the breast and at the leg. You’re looking for 160 degrees internal temperature. Return to oven and check every 10 minutes until 160 degrees is reached. Remove chicken from oven and let rest for 10-15 minutes. Carve chicken and serve with Cauliflower-Moc-Shoe or steamed broocoli. Recipe straight from the amazing Nom Nom Paleo. Makes 6 servings, Total time: 4 hours, hands-on time: 30 min. Trim away loose leaves from the lemongrass, and cut it into 3-inch lengths. Bruise it with a heavy, flat object like the flat side of a knife. Toss the beef, lemongrass, and fish sauce into a large bowl. Grate the ginger with a microplane. Add the ginger, curry powder, applesauce, and bay leaf to the meat, and mix everything well. Allow the meat to marinate for about 30 minutes. Heat the Ghee in a large Dutch oven over medium-high heat. Remove the beef from the marinade, but set aside the lemongrass and bay leaf. Sear the beef in batches, browning the meat evenly all over. Transfer the seared beef to a plate. Toss the onions into the empty Dutch oven and cook until they caramelize. Drain the tomatoes and crush them by hand. Once a paste forms, add the beef, lemongrass, bay leaf, and star anise. Raise the heat to medium, and continue cooking for another 5 minutes, stirring occasionally. Add the water and the chopped carrots to the pot, raise the heat to high, and bring the stew up to a boil. Replace the lid on the Dutch oven and braise in the oven at 300 degrees F for about 2 1/2 hours or until the brisket becomes tender. Scoop off any scummy looking stuff on top of the stew and adjust the seasoning as necessary. Remove the lemongrass, bay leaf, and star anise, and top with some freshly chopped cilantro before serving. 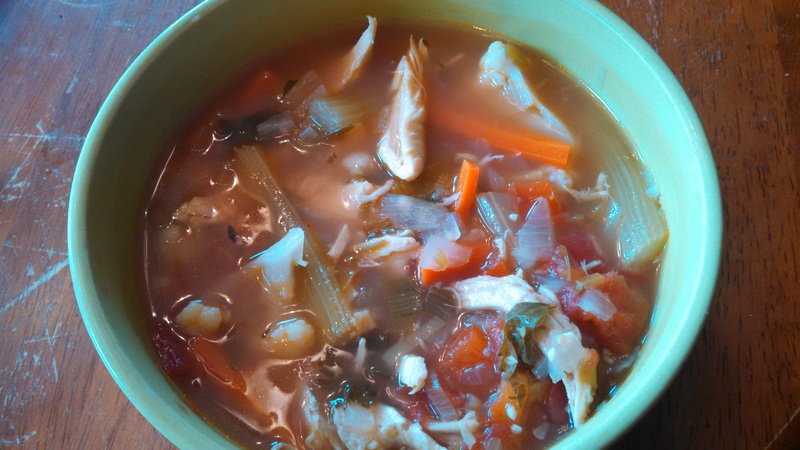 My new favorite soup from paleoleap! Very flavorful, and even the kids ate it, vegetables and all! That makes it an instant winner in my house. Serves 8, Prep: 20 min., Cook: 25 min. In a large stockpot, melt the cooking fat over a medium heat, and gently cook the onion, garlic, leek, and chicken for about 5 minutes, or until the onion is nice and tender. Add the rest of the vegetables, bay leaves, thyme sprigs, and parsley, and cover it all with the 6 to 8 cups of chicken broth. Bring the soup to a boil, then reduce the heat and simmer for 20 minutes. Season to taste with sea salt and freshly ground black pepper. 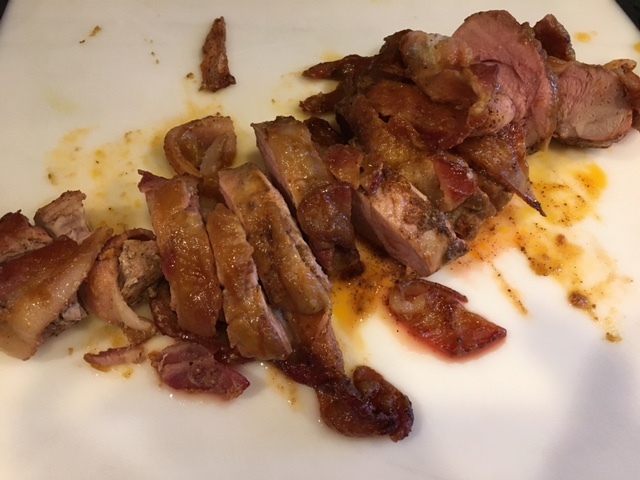 Credit for this recipe goes to You Hunt, I gather. LOVE the flavor and it is soooo easy!!! A kid favorite too! 4. Salt and pepper the skins. (I didn’t add any salt – figured the bacon was salty enough, but it’s your preference here). 3. Grab a piece of bacon and begin wrapping each piece of chicken making sure the skin side is up so that the bacon ends end up on the bottom. You can squeeze the thighs together a little bit (almost folding them in half) so they can be wrapped snugly then place them back in your dish. 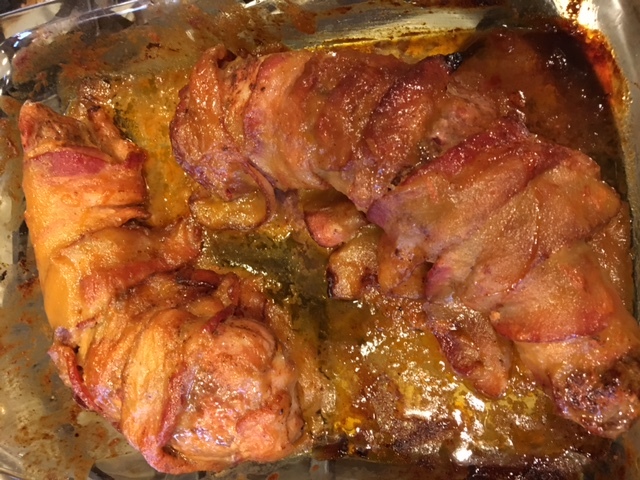 I used two pieces of bacon per thigh. You can never have too much bacon! 4. In a small bowl, whisk together the honey, mustard, hot sauce and garlic powder until well combined. (I left out the hot sauce to ensure they stayed “kid friendly”). 5. 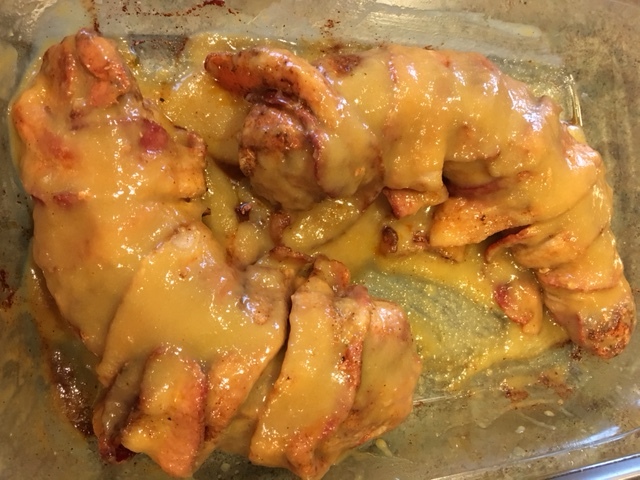 With a pastry brush, cover your thighs using half of the honey-mustard sauce. Don’t worry about basting the bottoms. The juices start flowing and there’s plenty of flavor. 7. Baste the thighs again and let them go another 20 minutes. 8. Turn your broiler on and let them crisp up for 5-10 minutes. This is what I’m craving for tonight – an easy and tasty dish from Practical Paleo! Slice the spaghetti squash in half lengthwise so that two shallow halves remain. Scoop out the seeds and inner portion of the squash, and then sprinkle with sea salt and black pepper. Place both halves face down on a baking sheet. Roast for 35-45 minutes—until the flesh of the squash becomes translucent in color and the skin begins to soften and easily separate from the “noodles” that make up the inside. Allow the squash to cool enough so that you can handle it, and then scoop the flesh out from the inside of the skin into a large serving bowl. Set aside until the sauce is finished. While the squash bakes: In a large skillet over medium-high heat, melt the bacon fat or butter, and sautée the onions, carrots, and celery until they become translucent. Add the garlic and cook for an additional minute. Add the ground veal, pork, and bacon, and cook until browned through. Once the meat is done, add the coconut milk, tomato paste, and white wine (optional), and simmer over medium-low heat for 20-30 minutes or until the sauce is well combined and any alcohol is cooked out (if you added it). Add sea salt and black pepper to taste before removing the sauce from the heat. Serve over the roasted spaghetti squash.